UAM Radio: “En Contraste“; “Innovadores“. Have a taste of it! I might be able to provide a copy or draft of some of these papers (contact me). • Pérez y Pérez, R. (2018). Introducción a la creatividad computacional: el caso del proyecto MEXICA-impro. En I. Galina, M. Peña, E. Priani, J.F. Barrón, D. Domínguez y A. Álvarez (Coord.) Humanidades Digitales: Lengua, texto, patrimonio, datos. Bonilla Artigas Editores: Ciudad de México, pp. 75-110. • Pérez y Pérez R. (2018). 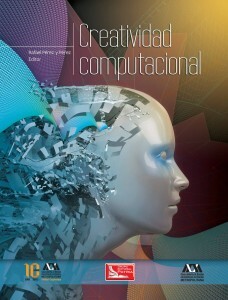 Comunicación e Interdisciplina: Perspectiva desde la Creatividad Computacional. En D. Crovi (Coord. ), Sociedad del conocimiento y comunicación: reflexiones críticas desde América Latina. Ciudad de México: La Biblioteca, pp. 199-210. • Pérez y Pérez, R. (2017). 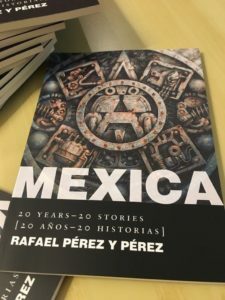 MEXICA: 20 years – 20 stories [20 años – 20 historias]. Denver, CO: Counterpath Press. •Pérez y Pérez, R. (2015). A Computer-based Model for Collaborative Narrative Generation. Cognitive Systems Research, 36-37. pp. 30-48. (DOI: 10.1016/j.cogsys.2015.06.002). • Pérez y Pérez R. (2015). From MEXICA to MEXICA-Impro: The Evolution of a Computer Model for Plot Generation. In T.R. Besold, M. Schorlemmer, A. Smaill (Eds. ), Computational Creativity Research: Towards Creative Machines, Atlantis Thinking Machines 7. • Pérez y Pérez R. (2015). Reflexiones sobre las características del trabajo interdisciplinario y sugerencias sobre cómo fomentarlo en el aula universitaria. En Vicente Castellanos (Ed.) Estudios Interdisciplinarios en Comunicación, pp. 35-50, México D. F.: UAM Cuajimalpa. • Aguilar, W. & Pérez y Pérez, R. (2015). Dev E-R: A computational model of early cognitive development as a creative process. Cognitive Systems Research, 33, pp. 17–41. • Pérez y Pérez, R. (2014). The Three Layers Evaluation Model for Computer-Generated Plots. In Proceedings of the Fifth International Conference on Computational Creativity, Ljubljana, Slovenia, pp. 220-229. (http://computationalcreativity.net/iccc2014/proceedings/). • Guerrero-Román, I. and Pérez y Pérez, R. (2014). Social Mexica: A Computer Model for Social Norms in Narratives. In Proceedings of the Fifth International Conference on Computational Creativity, Ljubljana, Slovenia, pp. 192-200. (http://computationalcreativity.net/iccc2014/proceedings). • Gómez de Silva Garza, A., and Pérez y Pérez, R. (2014). Towards Evolutionary Story Generation. In Proceedings of the Fifth International Conference on Computational Creativity, Ljubljana, Slovenia, pp. 332-335. (http://computationalcreativity.net/iccc2014/proceedings/). • Aguilar, W., and Pérez y Pérez, R. (2014). Criteria for Evaluating Early Creative Behavior in Computational Agents. In Proceedings of the Fifth International Conference on Computational Creativity, Ljubljana, Slovenia, pp. 284-287. (http://computationalcreativity.net/iccc2014/proceedings/). • Gómez de Silva Garza, A. Cambria, E. Pérez y Pérez, R., (2014). Commonsense Knowledge As The Glue In A Hybrid Model Of Computational Creativity, Proceedings of the 4th Sentiment Elicitation from Natural Language Text for Information Retrieval and Extraction (SENTIRE) Workshop of the 14th IEEE International Conference on Data Mining (ICDM’14), pp.360-364. • Pérez y Pérez, R. y Castellanos, V. (2013). Ya no se cuentan las historias como antes: transformación de las narrativas en la era digital. Revista Latinoamericana de Ciencias de la Comunicación, 10 (19), pp. 66-75. •Pérez y Pérez, R., Morales, N., Rodríguez, L. (2012). Illustrating a Computer Generated Narrative. In Proceedings of the Third International Conference on Computational Creativity, Dublín, , pp. 103-110. • Pérez y Pérez, R., Castellanos,V., Ávila, R., Peñalosa, E., Negrete, S. (2011). Mexica-impro: ideas para desarrollar un modelo computacional de improvisación. CIENCIA ergo sum, Vol. 18, Número 1, pp. 35-42. • Perez y Perez, R., Ortiz, O., Luna, W. A., Negrete, S., Peñaloza, E., Castellanos, V., and Ávila, R. (2011). A System for Evaluating Novelty in Computer Generated Narratives. In Proceedings of the Second International Conference on Computational Creativity, México City, México, pp. 63-68. • Pérez y Pérez, R., Aguilar, A., and Negrete, S. (2010). The ERI-Designer: A Computer Model for the Arrangement of Furniture. Minds an Machines, Vol. 20, number 4, pp. 483-487. DOI: 10.1007/s11023-010-9208-9. • Veale, T., Gervás, P., Pérez y Pérez, R., (2010). Computational Creativity: A Continuing Journey. Minds an Machines, Vol. 20, number 4, pp. 533-564. • Perez y Perez, R., Negrete, S., Peñaloza, E., Castellanos, V., Ávila, R. and Lemaitre, C. (2010). MEXICA-Impro: A Computational Model for Narrative Improvisation. In Proceedings of the international conference on computational creativity, Lisbon, Portugal, pp. 90-99. • Gervás, P., Pérez y Pérez, R., Sosa, R., Lemaitre, C. (2007). On the Fly Collaborative Story-Telling: Revising Contributions to Match a Shared Partial Story Line. In Proceedings of the 4th International Joint Workshop in Computational Creativity, Goldsmiths, University of London, pp.13-20. • Álvarez, M., Pérez y Pérez, R., Aliseda, A. (2007). A Generative Grammar for Pre-Hispanic Production: The Case of El Tajín Style. In Proceedings of the 4th International Joint Workshop in Computational Creativity, Goldsmiths, University of London, pp. 39-46. • García, R., Gervás, P., Hervás, R., Pérez y Pérez, R., Arámbula, F. (2006). A Framework for the E-R Computational Creativity Model. Lecture Notes in Computer Science: MICAI 2006, Advances in Artificial Intelligence, pp. 70-80. • Acosta, E., and Pérez y Pérez, R. (2006). The Geometrician: a Computer Prototype of Problem Solving in Geometry Construction. In Sun, R. ed. Proceedings of the 28th Annual Conference of the Cognitive Science Society, p. 2435. • Rodrigo García, Pablo Gervás, Raquel Hervás, y Rafael Pérez y Pérez (2006). Applying the E-R Computational Creativity Model to Image Interpretation. In S. Colton & A. Pease (eds.) Proceeding of the Computational Creativity Workshop, ECAI’06,( pp. 29-32). Riva del Garda, Italy. • Acosta Villaseñor, E. & Pérez y Pérez, R. (2005). The Geometrician: a computer model for problem solving in the field of geometry. In P. Gervás, A. Pease and T. Veale (eds. ), Proceedings of the Second Joint Workshop on Computational Creativity, at the 19TH International Joint Conference on Artificial Intelligence (IJCAI’05), (pp. 10-16). Edinburgh, Scotland. • Pelczer, I. & Pérez y Pérez, R. (2005). A model of believable-characters for a computer based storyteller. In P. Gervás, A. Pease and T. Veale (eds. ), Proceedings of the Second Joint Workshop on Computational Creativity, at the 19TH International Joint Conference on Artificial Intelligence (IJCAI’05), (pp. 101-104). Edinburgh, Scotland. • Pérez y Pérez, R. y Gamboa, F. (2004). Importancia de Modelos del Proceso Creativo en la IHM. En: Miguel Arias Estrada y Alexander Gelbukb (eds. ), Avances en la Ciencia de la Computación, (pp. 86-95). Taller de Interacción Humano-Computadora del Encuentro Internacional de Computación ENC’04. Colima, México: Universidad de Colima, Mexican Society of Computer Sciences. • Pérez y Pérez, R. (2004). Words, Emotions and Plot Generation. In: T. Veale, A. Cardoso, F. C. Pereira & P. Gervás (eds. ), Proceedings of the Workshop on Language Resources for Linguistic Creativity at the 4th Language Resources and Evaluation Conference LREC 2004, (pp. 17-20). Lisboa, Portugal: European Language Resources Association. • I Pelczer, F. Cabiedes, F. Gamboa, R. Pérez y Pérez, J.L. Pérez. (2003). Emotions and Interactive Agents: perspectives toward educative software development. Memorias del Congreso Latinoamericano de Multimedieros Universitarios, México D. F.
• Pérez y Pérez, R. & Sharples, M.(1999) MEXICA: A Computational Model of the Process of Creative Writing. Proceedings of the AISB Symposium on Creative Language: Humour and Stories, Edinburgh, pp. 46-51. •Pérez y Pérez, R. (1999). MEXICA: A Computer Model of Creativity in Writing. DPhil Dissertation, University of Sussex, UK. • Pérez y Pérez, R. (1996) Creativity in Writing, en Proceedings of the Second International Symposium Creativity and Cognition, Loughborough, England.